Domino's is coming to the aid of US pizza-lovers reluctant to pick up the phone or fill in an online order form by introducing a service whereby consumers need only tweet a pizza slice emoji to the chain's Twitter handle to make their order. Regular Domino’s customers will not even have to type in their pizza choice once they have entered their ‘easy pizza’ preference on their Domino’s Pizza Profile, which is linked to their Twitter account. 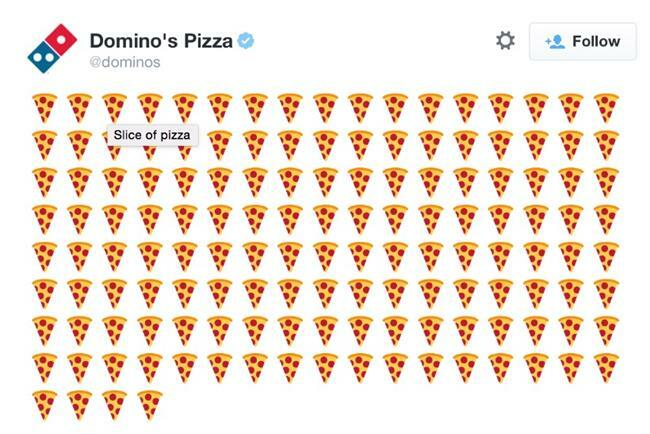 For the emoji-averse, Domino's is also allowing customers to tweet the hashtag #EasyOrder to @Dominos. Patrick Doyle, Domino’s chief executive, told USA Today: "It’s the epitome of convenience. We’ve got this down to a five-second exchange. A Domino’s UK spokesperson hinted to The Telegraph that the service may become available in the UK, saying: "We’re really excited to see our Domino’s colleagues in the US take their ordering service to the next level. Here in the UK we pride ourselves on being at the cutting edge of digital innovations so watch this space." Domino’s is embracing technology, launching many innovations including being able to order pizza through an XBox gaming console; allowing people to use their smartwatch to order; while on 1 April it announced plans to introduce a driverless pizza delivery bike in the UK. The latter transpired to be an April Fool’s joke.